During his first Christmas in the White House in 1953, Eisenhower referred to Hallmark President Joyce C. Hall for assistance with his first official Christmas cards as the President of the U.S. An artist himself, Eisenhower painted a portrait of Abraham Lincoln while waiting for news on a Korean armistice. For inspiration, he used a photograph of Lincoln done by Alexander Gardner in 1863. Eisenhower ordered 1,100 white keepsake folders from Hallmark, each containing a reproduction of his Lincoln painting. All of the folders were embossed with the official Presidential Seal. Over 500 of the reproductions were given to White House staff members at the annual Christmas party. Each folder was accompanied by a gift enclosure Christmas card imprinted with the words “Season’s Greetings” in gold. President Eisenhower also had Hallmark produce 1,100 official White House Christmas cards to be sent to diplomats, government officials, Cabinet members, and Congress members. The card design was on an ivory stock and bore an embossment of the Presidential Seal along with the words “Season’s Greetings” in gold. The following message was engraved in black on the inside of the card: “The President and Mrs. Eisenhower extend their best wishes for Christmas and the New Year”. Hallmark also produced 500 informal Christmas cards for the President and First Lady to send to their close and personal friends. The design of the informal Christmas cards contained an embossment of holly leaves and red berries; “Mamie and Ike” was engraved on the inside in the First Lady’s handwriting. Before lighting his first National Community Christmas Tree for over 4,000 onlookers, Eisenhower gave the President’s annual Christmas speech from inside the White House. His words expressed contentment with the Korean armistice but also acknowledged the cold war that still existed. President Eisenhower’s first Christmas speech was broadcast via radio and television and was transmitted around the world by Voice of America radio in over 30 languages. With the success and high demand of his Lincoln portrait, Eisenhower painted a portrait of George Washington to be given as a Christmas gift in 1954. He painted the portrait while on a fishing trip in Colorado, using the well-known painting by Gilbert Stuart as inspiration for his own work. 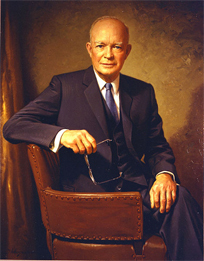 Similar to the prior year, President Eisenhower had Hallmark reproduce 1,300 lithographs of his work, each accompanied by a folder embossed with the Presidential Seal. Eisenhower also ordered 1,300 gift enclosure Christmas cards from Hallmark to accompany each portrait reproduction. The enclosure cards were adorned with the Presidential Seal and contained the red bordered imprint, “Season’s Greetings 1954.” The President gifted the lithographs to over 650 White House staff members as well as select Cabinet members and Congressmen. In addition to the portrait reproductions, Eisenhower ordered from Hallmark 1,300 official White House Christmas cards. Each card featured a smooth white design with an embossed Presidential Seal, a gold foil eagle, and a patriotic silk screened shield. Hallmark artists also created two personal Christmas cards designs for the Eisenhowers. The first of the personal Christmas cards featured a white embossed wreath with a red-inked bow and berries. Hallmark artists discovered that when stacked, the ink from the berries was transferring to the back of the card on top. To quickly remedy this problem, they coated each of the 42 berries on all 400 Christmas cards with clear polish, keeping the red ink from bleeding. For the second of the personal Christmas cards, an artist from Hallmark designed a gift card for the First Lady to send to her nearest-and-dearest friends. These Christmas cards were trademarked as the “Mamie Bangs” cards because they featured a whimsical caricature of the First Lady’s unique hairstyle. Needless to say, the effervescent First Lady loved them. On December 17, President Eisenhower lit the National Community Christmas Tree as a part of the opening ceremony for the first annual Pageant of Peace. The Pageant of Peace was a 21-day celebration of Christmas, drawing over 300,000 visitors to the festival which took place on the Ellipse. Eisenhower continued his tradition of painting for his 1955 Christmas gifts, but instead of a portrait of a past President, he painted a landscape near Fraser, Colorado, where he frequently visited to go fishing. The painting was entitled St. Louis Creek, Byers Peak Ranch. However, in the midst of his work, Eisenhower suffered a heart attack and was rushed to Fitzsimmons Army Hospital in Denver. While recovering in his hospital bed, the President finished his painting so that it would be received by Hallmark for reproduction in time for Christmas. The official White House Christmas cards maintained a similar design to the year prior, the only change being an addition of a blue silk screened background and gold foil stars. Hallmark artists also created another personal Christmas card design for the First Family, as well as a second rendition of the “Mamie Bangs” Christmas cards. On December 16, from the office of the President of Gettysburg College, Eisenhower lit the National Community Christmas Tree and issued the President’s official Christmas message to the American people. Having suffered a heart attack only several months prior, his message was more personal than in previous years. As a part of his speech, Eisenhower said: “It has been heartwarming evidence that human understanding and human sympathy can surmount every obstacle – even those obstacles that some governments sometimes seem to raise in the attempt to divide us.” Having spent Christmas during their first two years in the White House at their home in Augusta, Georgia, the President and First Lady decided to stay in Washington for Christmas of 1955. 1956 was an election year, and Eisenhower maintained the Presidency with 86% of the Electoral vote. The newly re-elected President underwent emergency surgery for an ileitis attack in June, which disabled him from painting a portrait or landscape for that year’s annual White House Christmas gift. Instead, he gave a gift portfolio containing side-by-side black and white photographs of himself and the First Lady. Eisenhower ordered 1,750 portfolios from Hallmark to be given to White House staff members as well as Cabinet members and other government officials. He also ordered 1,750 gift enclosure Christmas cards, requesting 200 to be left blank for personalization. Several days before Christmas, 175 of the portfolios were returned to Hallmark for engraving, but with such short notice, Eisenhower said it would be okay if they were received after Christmas. Passionate about Christmas cards and the giving of the season, Hallmark’s Joyce C. Hall promised the President he would receive the engraved portfolios in time for Christmas. The engraving was speedily completed, but the photographs, which were being air shipped from Rochester, New York, never made it due to inclement weather. To remedy this situation, Hallmark employees took pictures of the actual photographs and used the copies as placeholders. The official 1956 White House Christmas cards reflected the gold-trimmed China pattern that the Eisenhowers selected for their second term in the White House. The card design featured a gold foil eagle laid over the Presidential Seal with a gold background and “Season’s Greetings 1956” imprinted on the front. Eisenhower ordered 1,900 of these White House Christmas cards from Hallmark. He also ordered 800 personal Christmas cards with a design featuring the front door of Eisenhower Farms, the first Family’s weekend getaway near Gettysburg, Pennsylvania. On December 20, the 67-foot Engelmann spruce from New Mexico was lit on the Ellipse, marking the beginning of the annual Pageant of Peace. President Eisenhower spoke of Americans, who “inspired by the story of Christmas,” helped to spread good will to those less fortunate. Other communities across the nation leased Western Union wires to time their tree lightings perfectly with the National Community Christmas Tree. For the Christmas gift to their staff in 1957, the Eisenhowers gave a color photograph of the Green Room in the White House. Each photograph contained a hand-written imprint by the President, eliminating the need to order gift enclosure Christmas cards. They ordered 1,950 gift folders from Hallmark to encase and protect each photograph. Also from Hallmark, Eisenhower ordered 2,500 official White House Christmas cards. The design that year took on a rectangular shape and featured an embossed Presidential Seal with a gold foil eagle and stars on a white background. Additionally, the President and First Lady ordered 800 personal Christmas cards that featured their house at Eisenhower Farms in silver foil. A 60-foot white spruce from Minnesota was used for that year’s National Community Christmas Tree. In the President’s Christmas message, he spoke of the United States’ dedication to NATO, expressing our “determination and readiness collectively to sustain” peace with our NATO partners. For the Presidential Christmas gift in 1958, Chief Executive Eisenhower had reproductions made of his own painting, Deserted Barn, on which he worked at his farm in Gettysburg. To encase each repro, Eisenhower ordered 2,150 gift folders from Hallmark. He also ordered 2,100 official White House Christmas cards with a design featuring the traditional gold foil Presidential Seal on cream-colored stock. For the First Family’s personal Christmas cards, Hallmark created a custom design featuring a painting of the Eisenhower Museum in Abilene, Kansas framed by a Christmas wreath. The First Lady ordered 300 of this design. The First Lady also ordered 200 humorous and informal Christmas cards from Hallmark, which included Ike and Mamie on the cover in Santa suits along with a gold greeting that read, “We Wanted to put something of ourselves in our Christmas card to you…”; the inside of the card featured side-by-side whimsical ovular frames of Mamie’s lipstick imprint in pink and the President’s fingerprint in black. At 5PM on December 23, the 74-foot Engelmann spruce from Montana was set aglow with 7,000 lights on the Ellipse, initiating the lighting of community Christmas trees across the nation. In response to recent fighting that broke out in the Middle East and in Vietnam, President Eisenhower declared in his Christmas message that “the people of the United States and their Government do not want war,” but instead want “to make Peace on Earth.” With Alaska becoming the 49th state on January 3 of the following year, the Alaskan governor and citizens gave to the President and the American people a gift of ten live reindeer. In 1959, Eisenhower gave reproductions of his painting, Mount Eisenhower, as a Christmas gift to his White House staff. Mount Eisenhower, located in Banff National Park in the Canadian Rockies, was formerly known as Castle Mountain. It was renamed on January 11, 1946 by Prime Minister Mackenzie-King to honor General Eisenhower’s leadership of the Allied Forces during World War II (the name has since been changed back to Castle Mountain). Hallmark printed 2,200 gift folders to encase the Mount Eisenhower reproductions and 1,200 gift enclosure Christmas cards. The President ordered 2,900 official White House Christmas cards, which took on a more patriotic design theme than in previous years. The design itself featured a red, blue, and white silk-screened background with an updated version of the official Presidential Seal, which not contained 50 stars instead of 48 to represent the addition of Alaska and Hawaii as states. The design of the First Family’s personal Christmas cards featured a watercolor of the Little House on their Gettysburg farm accompanied by a descriptive poem. For the First Lady’s personal gift enclosure Christmas cards, a new rendition of the “Mamie Bangs” card was created featuring a hat shaped our of holly, red berries, and a bow. 1960 marked Eisenhower’s last Christmas in the White House, and he wanted it to be the most memorable Christmas ever. For the White House staff, the President gave reproductions of his painting, Church in Bavaria, accompanied by the usual protective folder and gift enclosure Christmas card. Church in Bavaria was Eisenhower’s sixth painting that he would share with his White House staff during his presidency. The President ordered 3,100 official White House Christmas cards from Hallmark. Featured on an ivory stock, the design included the newly updated official Presidential Seal atop a crimson red vertical silk-screen ban. For the Eisenhowers’ last personal Christmas cards as the First Family, Hallmark created a watercolor of the South Portico of the White House, which was the entrance most often used by the First Lady. My grandfather worked for the President in his time in office, and as such received two christmas cards. One being the Belgium church and the of Mount Eisenhower. my grandfather past away last year and the christmas cards were given to me. I greatly cherish these not only because they were given to me from my grandfather but also that they were given to him by a great man and kind wife. I recently came across a Christmas card from Mamie and Ike Eisnehower at a Estate sale. It is a Hallmark card and I am trying to find out more information on it. The card reads “Season’s Greetings, Merry Christmas and Happy New Year, Mamie and Ike 1953.” It sounds like the one you mentioned about 500 of their closes friends. Could you help me in finding out more about it? I was told to get the book season greetings from the white house it has all the cards in it and it gives a description of the paintings. Besides that I don’t know whom to get them appraised by orwhat there worth is. If you happen to find anything moe about them please let me know. I came across a thank you note from Dwight Eisenhower postmarked 6/25/10 in regard to his illness. I can’t seem to find any other information about these thank you notes. does anyone know of a print or painting done by President Eisenhower given by him to Andrew J. Goodpastor. One has been found and we are trying to find out more information to it’s authenticity if possible. My mother has a ceramic plate with the painting of the deserted barn on it. You can see and feel the brush strokes on it. I am wondering if anyone can give me more info on this plate. She recieved it from her grandmother in the ’70s. We are wondering if it is authentic or just a pretty plate. Eisenhower was born in Denison, TX, but his family left there when he was 2. He grew up in Abilene, Kansas. His home state should be Kansas.